Rattlesnake Pole Bean: ( 85 Days ) Heirloom Pods are a unusual, dark-green streaked with purple, round and 7 to 8 inch long. Vines grow up to 10 feet and produce an abundance of beans. Use fresh or let them mature for shelling. Very tolerant to heat and drought. Seeds are Light buff colored splashed with dark brown. Plant pole beans 1” deep on a small mound of soil that is about 6 inches in diameter and 3 inches tall around poles, fence, trellis, or teepees spaced at 16” apart. Sunflowers or corn stalks can also be used for bean supports. Plant 4-8 seeds on each hill. Space pole beans 3” apart if growing on a fence. Sow after all danger of frost is over and the soil is warm, 18°C (65°F). Growing pole beans gives you the advantage of maximizing your space, and the beans grow straighter and are easier to pick. Pole beans prefer an area with full sun and a rich, deeply worked soil with a pH level of 6 to 7.5. Pole beans are light feeders. The poles, teepees or a trellis should be erected after 2-4 leaves have developed. A mulch of compost, or straw is beneficial to control weeds and hold moisture. Keep the plants well watered in dry weather, especially if they are grown on an upright trellis or poles against a shed or house where soil tends to dry out. Pick young, full size pods when smooth and crisp. Harvest pole beans before you can feel the bean seeds inside the pods. Harvest pole beans regularly for a constant supply. Pole beans grow fast, so harvest at least three times a week to ensure you get the tastiest pods and to signal the plant that it needs to keep producing. Mosaic Diseases : The bean mosaic diseases cause plants to turn a yellowish green and produce few or no pods. 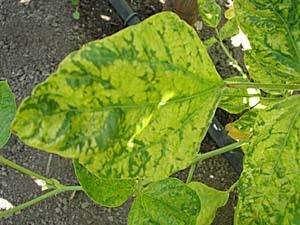 The leaves on infected plants are a mottled yellow and are usually irregularly shaped. 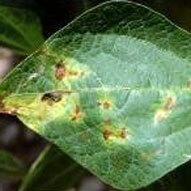 The only satisfactory control for these diseases is to use mosaic-resistant bean varieties. Rust of Bean : Most beans are susceptible to Rust. The disease occurs sporadically and is important only under prolonged periods of warm, moist weather. 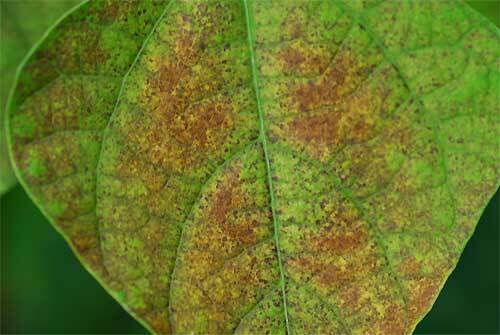 The Rust fungus exists in at least 35 pathotypes and is extremely variable. Symptoms develop on leaves and pods as pustules of red-brown powdery spores (urediniospores) which rupture the epidermis. They are often surrounded by a yellow halo. Severely infected leaves turn chlorotic, dry, and decline. Later, black to brown teliospores form within pustules and enable the pathogen survive between crop cycles. 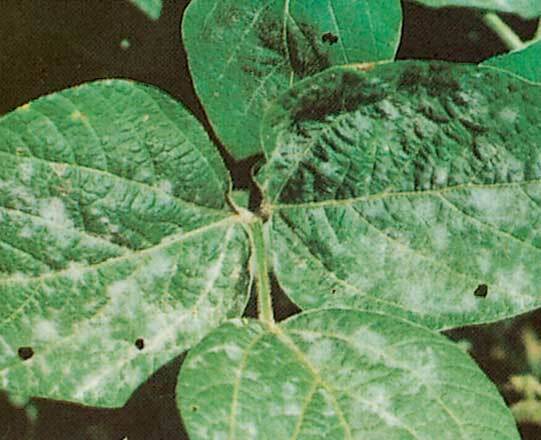 Powdery Mildew : This common bean disease thrive in both humid and dry weather. The spores are spread by the wind to healthy plants. the fungi sap plant nutrients , causing yellowing and sometimes death of the leaf. A severe infection may kill the plant. Powdery mildew can spread rapidly through a closely spaced planting. 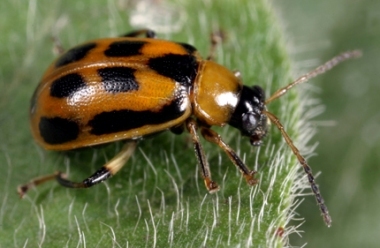 Bean Leaf Beetle : This insect attacks all beans. Adults feed on the underside of leaves, blossoms, and pods throughout the growing season. The beetles are yellow to red with black spots and a black band around the outer edge of the body. 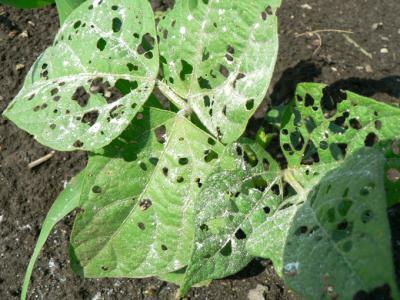 Both adults and grubs cause serious damage to young plant.